Although heart disease is more common in dogs, cats can be affected by heart disease as well. There are many types of heart conditions in cats but the most common is cardiomyopathy (cardio=heart; myo=muscle; pathy=pathology). There are many types of cardiomyopathies in cats that include hypertrophic, thyrotoxic, dilatative, restrictive, and unclassified. Although valvular heart disease and diseases affecting the pericardium do occur in cats, they are much less common. Clinical signs of heart disease in cats tend to vary. The most common include rapid shallow breathing, lack of interest in food, and isolation behavior or hiding. These signs occur because if the heart function is suboptimal, blood within the vascular space can back up and result in leakage of fluid. Fluid can accumulate within the lungs themselves (pulmonary edema) or between the lungs and body wall (pleural effusion). In some cases, fluid may also accumulate within the abdominal cavity. Cats who experience difficulty breathing are less likely to eat which is why lack of interest in food occurs. Other clinical signs of heart disease in cats that may be observed include a lack of energy, poor grooming habits, and in the most severe of circumstances the sudden loss of function of the rear limbs. The latter may occur when a blood clot forms within the heart chambers due to turbulent blood flow and distention. Blood clots may become dislodged and travel through the blood vessels to the point where the aorta divides into the back legs. The sudden lack of blood supply can be painful, results in rigid muscle activity, and limbs that are cool to the touch. Blood clot formation is a veterinary emergency and should prompt immediate evaluation by your veterinarian. Fortunately, many cats with heart disease can be treated successfully once a diagnosis has been made. Therapy is generally lifelong and requires that medications be administered on a daily basis. Heart disease is not considered to be something that can be cured, but most pets will enjoy a sustained quality of life. 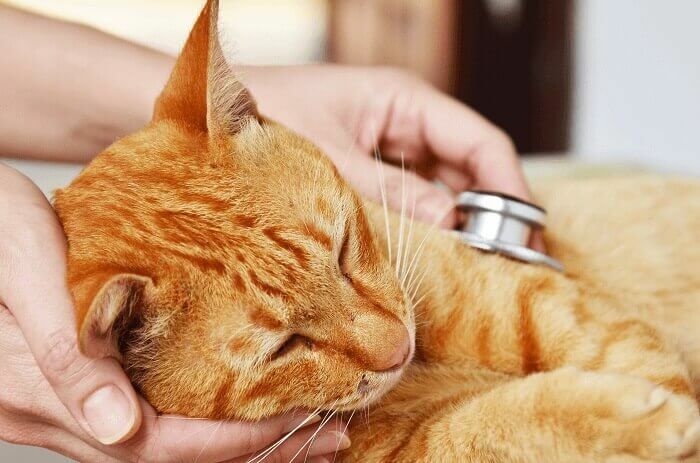 Learn more about how we treat heart disease in cats here at Southern Colorado Veterinary Internal Medicine HERE.